I never thought I’d say this about my home, the project house. Our progress has turned into a double-edged sword. On the one hand I don’t cringe as I drive in the driveway anymore because our house is the derelict rogue house on our street. It’s shaping up nicely. On the other hand, with each outdoor project I’ve completed I’ve lost valuable workspace to paint. It’s been a challenge. That changed this week. I just opened my new spray paint shelter for painting in small spaces. This my friends, is a game changer. When I started working on the Butterfly Garden & DIY Landscaping this summer I lost the last of my open area left to paint outdoors. Not that my neighbors won’t mind me setting up in the front yard anymore:). I’m sure they were tired of the paint and weed patch we called a front yard. I thought about building a paint booth. But that’s all I did..was think about it besides, I have no where to store something like that. When I painted my awesome deck chairs for our dock I tried taping plastic along our fence and over the bushes. It kind of worked until the breeze kicked in. 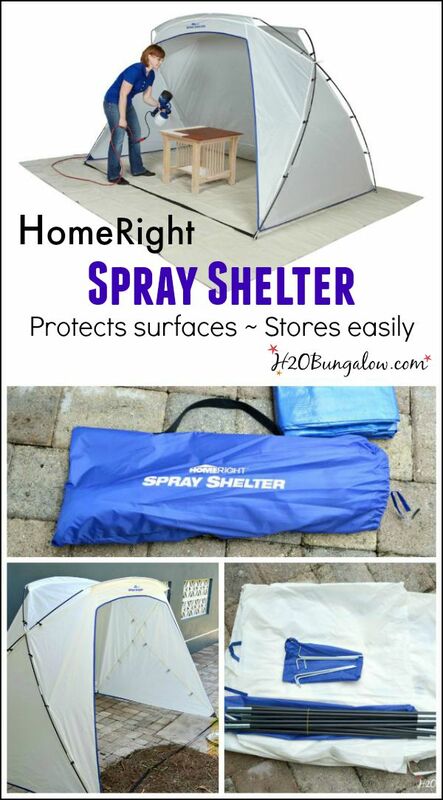 I think my contact at HomeRight felt sorry for me because she sent me an email and asked if I wanted a Paint Shelter . A paint shelter? Really? Yes!! This spray paint shelter is a game changer my friends. It’s 66″ tall and 102″ wide and will easily fit a large dresser on the inside. 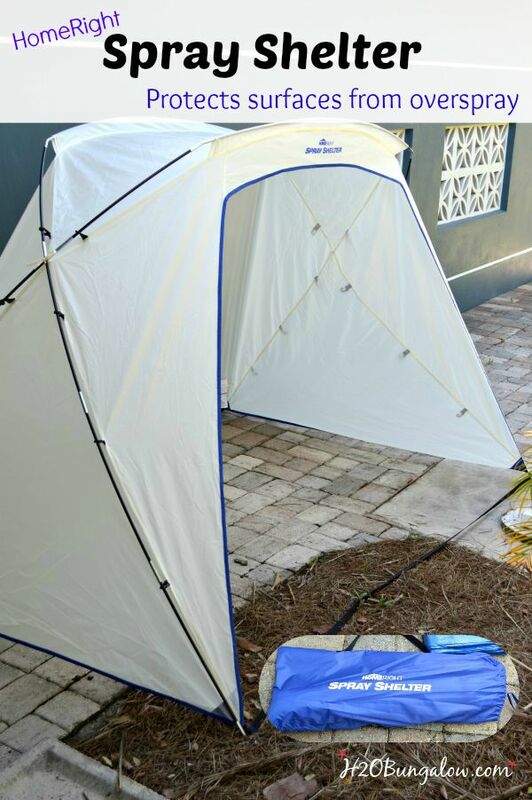 It assembles just like a tent. Lay a dropcloth down and you’re in business. It will work on any flat surface. It’s fantastic for all paint jobs, and protects your work area from overspray and your painted piece from dust and debris in the air. 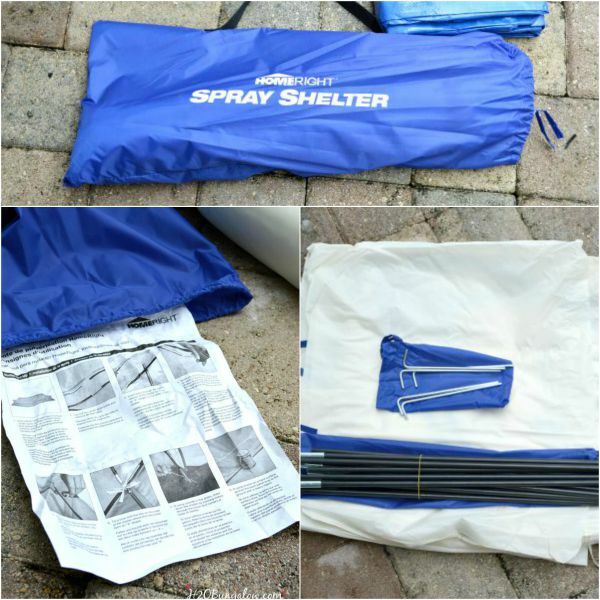 When your done painting, store your spray paint shelter away neatly in the small 29″ compact heavy duty bag it comes in. They’ve even attached the assembly directions on a permanent sheet. I don’t think you’ll need them though, assembly is easy. Do you love it? Please pin & share this! 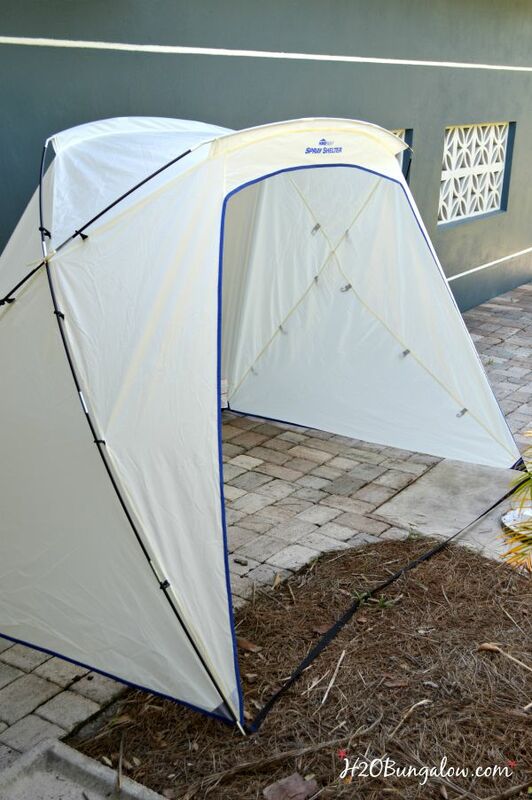 At under $50 on Amazon and free shipping on Prime, the HomeRight Paint Shelter is a steal! Still need a paint sprayer? I highly recommend these Fine Finish Sprayer or the Finish Max Pro. I have both and swear by them. 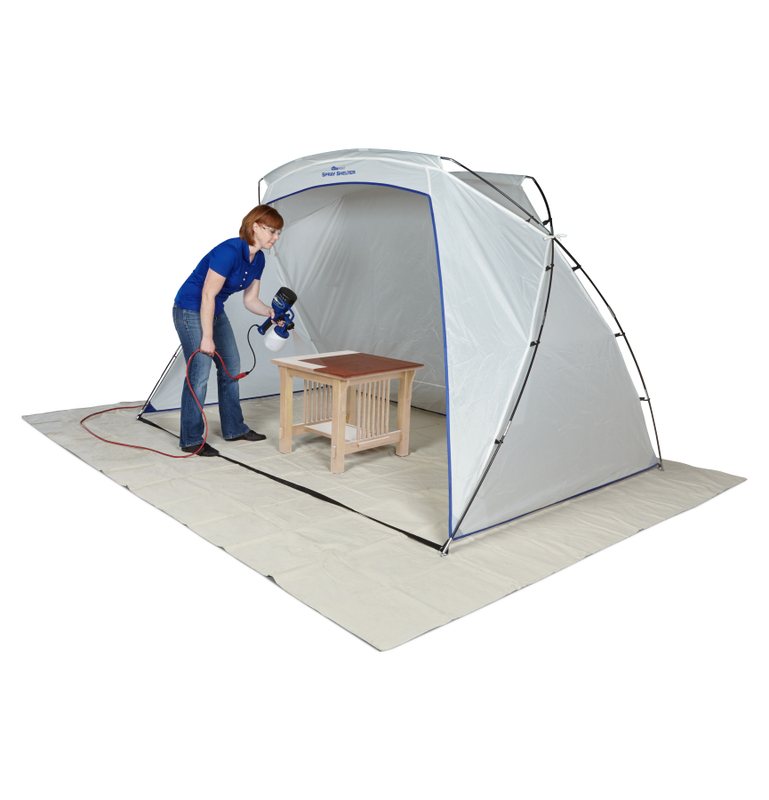 Where would you use a paint shelter for your paint projects? 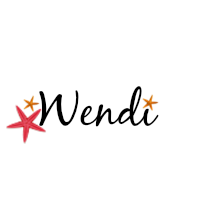 As you might have guessed this is a sponsored post, an contains affiliate links. I was provided product and, or compensated for sharing this information. All opinions, craftiness, and projects are 100% my own and never for sale. I’ll only share items I think have value for my readers. I just bought it and you have saved me so much grief…and possibly my new white car!! Hi Eileen! Wow, I’m so glad I had a hand in saving your white car! I love white cars too. Seriously, you will love the Paint Shelter. Plus, it folds down into a tiny little storage bag so it doesn’t take any space. You’ll have to share what you paint when you break it open:) Thanks so much for your visit & have a fabulous weekend! Thanks so much Debbie:) The videos are a bit challenging…but after doing a few I’me getting better. 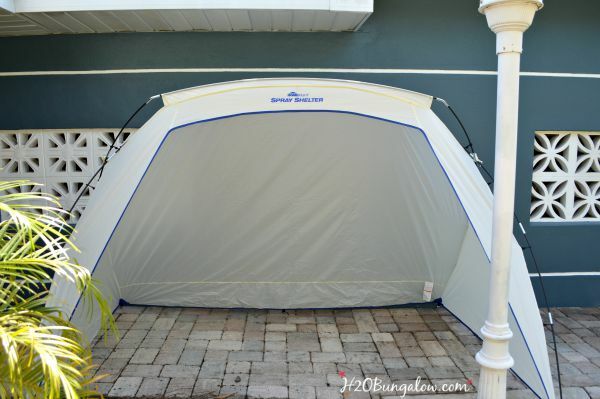 The spray tent was so easy to put up, I wanted to share the steps. Have a great day! I SO need one of these! Yesterday I swear I lost a full can of spray paint in overspray in my back yard. You do! Seriously, you’ll fall in love with it for keeping everything contained and it’s easy to put up & put away! Interesting product. I have never seen this before. Good pun Jennifer! It’s an awesome product. I wish I’d had one a long time ago. Painting projects will be a lot less weather dependent now:). There were plenty of days I couldn’t paint furniture outside because it was way too windy. That’s one big variable I don’t have to worry about anymore! Thanks so much for your visit!